I've been pretty tired from sailing four days straight + making all the charts/graphs for the GPS Challenge so haven't really had time to work doing any write ups! But today is a rest day for me so time to get cracking! The forecast for the whole weekend+friday was looking pretty good but according to the data we would have a pretty slow ebb tide. Obviously this wasn't the ideal conditions for any speed record breaking attempts so I came to the beach on friday focusing mainly on slalom training. The sand was blowing on the beach so I decided to rig my Koyote 6.6, AHD SL1 95, and 31 Vmax. Probably could've used the 7.5 Koncept but was powered up decently on the 6.6. I had to constantly remind myself every time I got close to the speed line that today was about slalom and not speed as a I had the urge to bear off deep... The wind itself was filled in maybe 2/3rds of the tack so not bad at all. Sailed maybe short of 2 hours as the wind started dying and only 1/3rd of the tack was filled by the time I stopped. Definitely felt like I broke 20 finally in Alpha@500...and I said I wasn't going for any records today..heh. Got home and rushed to the computer to check my results and ended up with a 30.90kt 2 sec peak and a best alpha@500 of 20.86kts! I was expecting a good alpha bu definitely not the 2 sec peak so I was quite content. Definitely pleased and will probably spend Saturday doing the same slalom training course I did today. Saturday was mainly spent doing slalom training/focusing in gybes. Basically a repeat of Friday. Sunday had been forecasted to be the stronger day of the weekend but in reality it started howling at noon on Saturday. Steve and I were the first to arrive and rig up so we caught the majority of the 20+ winds. Ended the day early too as I wanted to go spend time with Vivian. Sunday, supposedly the stronger day as forecasted proved to best to be decent. Since it wasn't howling I took my time to rig which resulted in the longest "from time of parking to on water" time of 1 hour...over 30 minutes slower than usual! oops haha. I blame that on me chatting with the folks,especially Cancho as he just got his new 2013 Starboard Isonic 117. Today I was planning to get in some good runs for a balanced session for the challenge but I had a change of heart after seeing the Isonic. Today was going to be another slalom day with my eyes set on the iSonic. On the water he had about a 2 tack head start as I had issues with my adjustable outhaul. Had to really focus on my turns to catch him as with out last encounter, Cancho had the pure straight line speed but lacked in turns. Today though his gybing seemed a lot better with some almost planning gybes so I really had to put the hammer down to catch him. I am definitely pleased to say I managed to catch him after about 5 tacks from start and ultimately lapped him 3 times after 16 tacks. We both were underpowered at times but for the majority of the session we were powered up. Definitely very pleased with my KA Koyote, for a non cam sail it has proven to be quite quick. Next year though I will be switching over to KA Koncepts as I have already placed my order with Jurg. 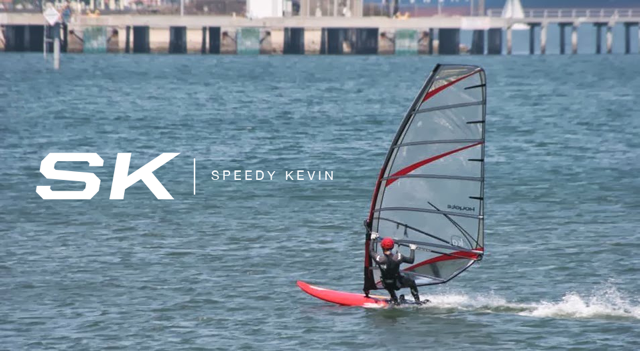 I don't have much TOW with the Koncept but with what time I have had I can say this, the Koncept has proven to be one of the best sails I have ever used. I'll be spending the majority of this week getting comfortable with an older Koncept and will write up a full report on my experience. But just for a quick recap, I used it yesterday and went past 30 knots so comfortably that I didn't even know that I had till I checked the gps. I also shattered the nautical mile and alpha@1000 record at Cabrillo. This sail is seriously fast and most importantly comfortable! A Fellow Wind Junkie Could Use Your Help! Possible Replacement for the GT-31?